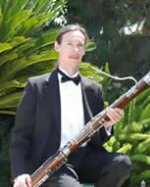 Eric Johnson-Tamai, bassoonist, is a graduate of California State University Long Beach where he studied with Kenneth Meyer. He also studied with Patricia Kindel as a member of the LA Philharmonic Orchestral Training Program. An active freelance performer and teacher in the LA area, he has played with the LA Philharmonic, California Philharmonic, Cabrillo Music Theatre, Antelope Valley, Bakersfield, South Coast, Riverside, Culver City and Marina del Rey summer Symphonies, and many others. He was a featured soloist with the Musica da Camera Orchestra of Bakersfield in 2002, the Bach-to-Beethoven Band in 2005 and, as a member of the Wind Advisory Quintet, he was invited to perform for the National Flute Association Convention in 2003.